This case study involved a proceeding in the Victorian Supreme Court to restrain logging at Brown Mountain in East Gippsland, Victoria, 300km East of Melbourne (a location map is available here). 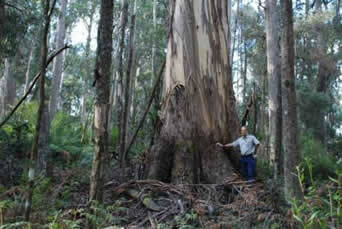 The case forms part of an extensive history of litigation against logging in the East Gippsland. In it, Environment East Gippsland Inc (EEG), a conservation group, succeed in establishing that proposed logging by VicForests, a government-owned corporation operated by the Victorian Government, was unlawful. EEG relied particularly on the Sustainable Forests (Timber) Act 2004 (Vic) and the Flora and Fauna Guarantee Act 1988 (Vic). Whether the balance of convenience favoured the grant of the interlocutory injunction. "There is an extraordinarily powerful consideration in favour of granting an interlocutory injunction. ... The photographs [of logging tendered by EEG] demonstrate the apparent total obliteration of the area of native forest as a result of logging and the subsequent burning off. To put it bluntly, once the logging is carried out and the native habitat destroyed, then it cannot be reinstated or repaired in anything but the very, very long term." Forrest J likened the photographs of logging, some of which are shown to the right of this page, to "pictures of the battlefields of the Somme". "I have concluded that security should not be ordered. This case is brought in the public interest; importantly, it involves consideration of the obligations (imposed by State legislation) of a State statutory corporation to comply with principles of conservation as they affect an endangered species. Accordingly, this is an exceptional case and EEG should not be required to provide security in addition to the usual undertaking as to damages." The matter proceeded to trial and the Supreme Court granted a permanent injunction restraining the logging. Decision granting an interlocutory injunction: Environment East Gippsland Inc v VicForests  VSC 386 (Forrest J). Map annexed to judgment by Forrest J showing the location of logging coupes 840-502-0015 and 840-502-0019 the subject of the proceedings and the interlocutory injunction. Decision refusing to order security for damages: Environment East Gippsland Inc v VicForests (No. 2)  VSC 421 (Forrest J). EEG has posted the transcript of the trial and the reports and exhibits it tendered together with written submissions on its website. There are extensive documents there and they will not be re-posted here. Decision stating the terms of the final injunction granted and awarding EEG costs: Environment East Gippsland Inc v VicForests  VSC 416 (Osborn J). Further details of the history of the case along with maps, pictures and film footage of logging at Brown Mountain, are available at Greenlivingpedia and the EEG website. Photographs of logging at Brown Mountain tendered in evidence and likened by Forrest J to "pictures of the battlefields of the Somme".